Moving is complete (unpacking begins) but I am back to work. Here comes the Andromeda X session. I also have a new t-shirt for sale. 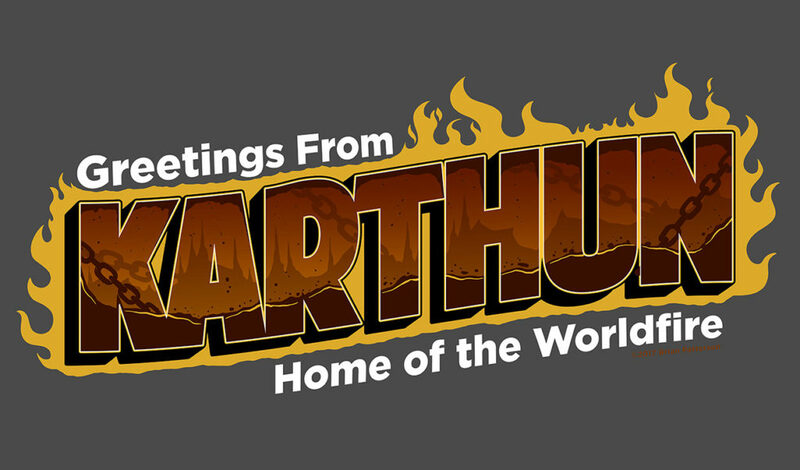 It is Karthun in nature. I think it would look great on you. HOVER-TEXT: I did that last panel with the space effects just because I want to. I know nothing about Fate, but this sounds very cool and I think Carlos is going to do a great job. 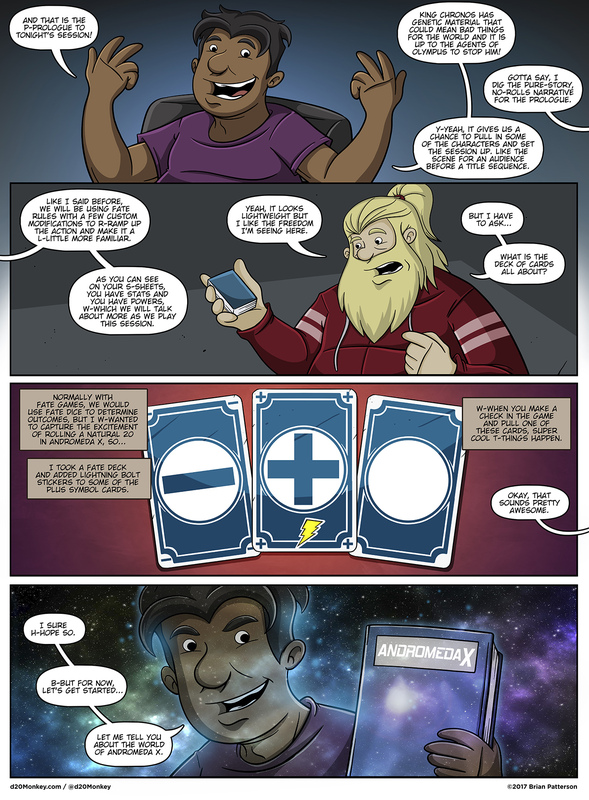 Here are the rules… in comic form! Glad to see Brett is (mostly) on board. Brett is like a lot of us: A work-in-progress. He’s trying. Oh God that last panel works! Fade into the world he unfolds to us. Groovesville! Do it, Carlos! You got this! Andromeda X is awesome, the strip is awesome, YOU are awesome, EVERYTHING IS AWESOME! EVERYTHING’S COOL WHEN YOU’RE PART OF THE TEAM! I’m diggin’ the prologue and looking forward to the main story. That last pannel is great. I imagined Carlos’ dialogue in an echoey fade out with end credit music rising. We are not worthy of this awesomeness. can’t wait to see what everyone else is playing! I know that i’m a little late to the party with this, but *please* tell me that Professor Wunder has discovered a new element, and has named it “Wunderflonium”! And the material can be shaped into super-strong structures called… Wunderbars! So glad to see you introducing FATE to more people. It’s such a versatile system. Re: Hover-Text – You beautiful show-off. I am going to thread the needle a bit with in-game and out-of-game action. I will not explain the rules into the ground, but I plan to hit the high points and get over the core concepts of FATE. Andromeda X, here we come. The last panel is a great way to transition into the world background. Looks awesome! Funny enough, that is exactly what I am going to do. Nice. A lot of information without a wall-o-text. Also, Carlos’ face in the final panel conveys both promise and menace. Can’t wait! I’m getting goosebumps! Aw yeah, hold on to your hat boy, we’re going for a ride! Wooohooo this looks so cool I love the affect in the last panel. I noticed Carlos seems to have a glow outline makes me wonder if it’s from working for the Clauses or DM power or just cause it looks awesome? Wintery-white glow denotes Santa power. The closest interaction I’ve had with FATE is that I once ran in a FUDGE game. I was curious if that’d hurt my ability to enjoy this run of the comic. Very interested to see the cast’s characters. Though Brett is kind of a superhero IRL. Is Brett the type who doesn’t wear his ring all the time?